In the garden: pleasant surprises. I finally finished my garden clean up this past weekend. I don’t have perennial beds at our new home; my new garden space is a combination of containers on the balcony and a plot at the nearby community garden. Clean up was easy: I had no issues with diseases with my container plants so all the soil was dumped into a large covered tote and left on the balcony for use next season, and the pots were all scrubbed and put into indoor storage so they don’t freeze and crack. Clean up at the community garden was also a cinch: our garden committee encourages members to leave plants in place and chop and drop them in the spring. (I am a huge fan of this! Keeping the dried plants in place over winter helps prevent a bit of soil crusting, as the garden is fully exposed during chinook winds and freeze and thaw cycles. The plants may also provide a safe haven for beneficial insects such as ladybugs, and the sunflowers in some of the other plots may be useful for hungry birds). I did pull the pumpkin and zucchini plants, as they were beset with a vicious case of powdery mildew. 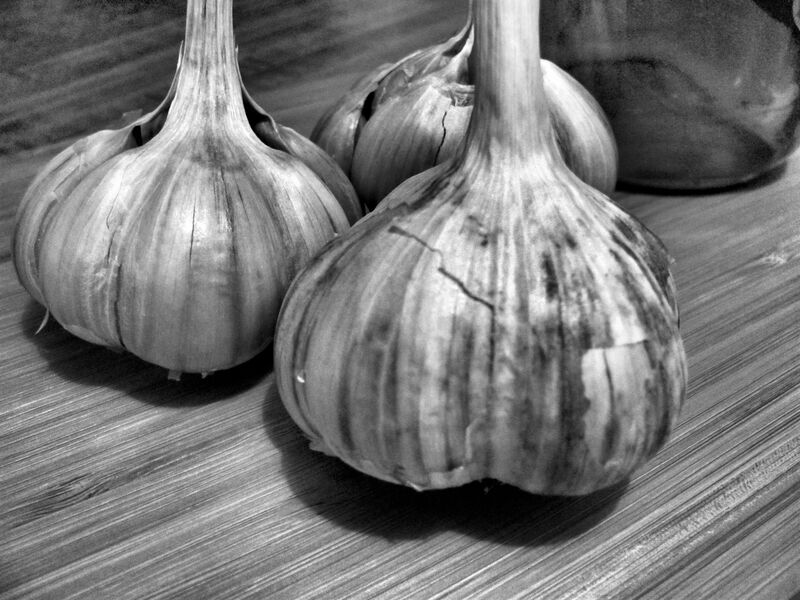 My garlic is planted at the community garden and mulched and hopefully snug for the winter, and I sunk a large container of alpine strawberries into the raised bed there in the hopes that they might survive. (I don’t have any in-ground spaces like I used to). I’ll winter sow some more strawberry seeds outside in early March as insurance. I haven’t had a lot of time to review this year’s gardening season. It was a challenging one, as far as the weather was concerned. Spring wasn’t gradual and wet; instead, we were blasted out of the gate with mid-summer-like heat and no rain. Some direct-sown seeds refused to germinate, even with supplemental irrigation. Our summer was hot and filled with forest fire smoke, and we had a couple of severe hailstorms that handily trashed plants in mere seconds. Many gardeners I talked to fought multiple insect infestations, but aside from the cutworms early in the season, I was fortunate in that regard. And then, just as everyone was still hoping their pumpkins would ripen on the vine and they would get some tomatoes that were a colour other than green, we were hit with two weeks of snowfall and bitter cold in September. One pleasant surprise in my garden (besides these) were the ‘Le Puy’ lentils I grew for the first time. The plants are pretty, resembling some of our common vetches so much that I thought perhaps I’d get in trouble for harbouring weeds. The deer find them attractive, as well, which definitely reduced the quantity I was able to harvest. Compared to some of my other plants, the lentils didn’t seem to require much care – a regular watering schedule was the most important thing, and they made it through the heat better than my sweet peas and sugar peas. I quickly realized that the timing of harvest is critical with lentils. The pods must be picked when they are dry, but if you wait too long (a scant few minutes, it seems! ), they shatter, blasting the seeds across the soil or the entire garden or into the parking lot in the street adjacent. I swear I could hear them pinging off the streetlights before I got to them. 😉 I still managed to collect enough to enjoy a decent snack (this recipe is easy to prepare and delicious!). Were there any pleasant surprises in your garden this growing season? What about any old favourites that were once again reliable? Book review: House Plants by Lisa Eldred Steinkopf. Throwing millennials and houseplants together seems to be a thing in the media these days; this (slightly tongue-in-cheek) article from The Washington Post is only one example of many that I’ve come across lately. One glance at the racks in your local garden centre will tell you that indoor gardening is indeed experiencing a resurgence – for everyone’s benefit! There are so many more plant selections available, and not just the succulents and air plants that have been trendy for the past few years. Looking after houseplants is meditative, nourishing, and just plain enjoyable, but only if you know what you’re doing. That’s what Lisa Eldred Steinkopf’s book is for: to help you succeed with your growing endeavours. In House Plants, Steinkopf (thehouseplantguru.com) thoroughly and precisely covers every detail: soil, water, light, containers, siting, propagation, and troubleshooting pests and diseases. Her advice is practical and easy to understand, even for those just getting into the hobby – this is a book that will definitely inspire confidence when it comes to keeping houseplants. (The chapter on propagation particularly impressed me, with its clear directions and accompanying photography). Indoor gardeners will appreciate that she even touches briefly on bonsai, topiary, living walls, water plants, and holiday plants, as these somewhat specialty niches become more mainstream. Of course, it’s truly the more than 125 profiles of houseplants that attracted me most to the book…I feel like I now have a goal to try them all at some point (don’t tell my hubby!). I love the fact that individual plants are categorized according to their difficulty of cultivation and maintenance (again, this gives me something to work towards!). From ferns to figs to palms, orchids, and dracaena – it’s all here and each one is beautifully photographed to aid in identification. Comprehensive, useful, and a delight to pore through, this really is the “complete guide” to houseplants! (Full disclosure: I was given a review copy of Lisa Eldred Steinkopf’s book House Plants by Cool Springs Press, an imprint of Quarto Publishing Group. All opinions are 100 percent my own. Heck, 300 percent my own). Apparently, it is National Poinsettia Day in the United States. I don’t have a poinsettia this year, although I love them. It’s been so cold here that transporting one from the garden centre to home might completely do it in before I even had a chance to enjoy it. Arctic air masses that lounge around for days and days on end are not fun for anyone, and especially not if you’re from the tropics, as this plant is. Which is also perhaps why it is not National Poinsettia Day here in Canada – we’ve established that temperatures in the minus mid-to-high twenties (that’s Celsius!) are not ideal for such a celebration. Really, for any celebration. Except one involving hot chocolate and Irish cream and a warm fireplace. Even if we don’t have a special day to honour poinsettias here in the frozen north, I can still share a fascinating bit of information: did you know that the dense, multi-branching habit and stunted growth of our holiday poinsettias results from infection by a type of pathogen? This article has more information about how it works. * And here is another for further perusal. Enjoy the reads – I’m off to petition the government to make National Hot Chocolate and Irish Cream and Warm Fireplace Day a reality. Are poinsettias part of your holiday celebrations? What colour is your favourite? And have you ever seen a poinsettia in tree form? (I haven’t). *UPDATED: I managed to track down a photo of a “wild” poinsettia, as the photo in the first link isn’t accurate – take a look here. Flowery Prose gets a makeover. In part because our spectacular sunny reprieve from winter is coming to an end (up to 10 centimetres of snow is predicted for tomorrow, which reminds me that I needed to buy new winter boots a few days ago…sigh) AND because I’ve been pondering it for some time, I’m announcing some additions to Flowery Prose. As many of you know, I’m what I term a “microgardener” – I live in a tiny one bedroom apartment (with no balcony or deck) and although I have soil to dig in – I look after the perennial gardens on the property where I live, and I rent a community garden plot every year – I have space limitations like you wouldn’t believe. Plus, there’s the not-to-be-overlooked-even-if-we-wanted-to fact that it is winter here in Alberta about six or seven months out of the year (if we’re lucky). In truth, it’s not always possible (or desirable) to post about my gardens’ goings-on, which is why you’ll see me touring other gardens or writing about the plants I see on my hikes or delving into some tidbit of plant lore I find while I’m doing research. I’m still going to do all of that. My blog is first and foremost about plants and gardening…I aim to keep the “flowery” in Flowery Prose. But I’m going to add some topics to the mix. As a freelance writer, I’ve covered everything from vinegar to minor hockey, and while things won’t be quite that eclectic around here, I’m eager to explore a bit more in the way of local history, nature, cooking and baking, and photography. I’ve already done a bit of that here in the past…only now I won’t necessarily add a plant or gardening connection. Except for gardening titles, my book reviews (or whatever you want to call what it is that I do over there) will still be found on my blog The Door is Ajar. I will still put up new content on my “Alberta snapshots” blog There is a Light, but for any of you who are subscribers to both Flowery Prose and There is a Light, there may be occasional overlaps. (Flowery Prose will always get the new posts before TIAL). My Facebook feed for Flowery Prose will remain the same: all plant stuff, all the time. (I love to scoop up links from online sources and share them). My Twitter feed contains links to gardening information, as well as notifications about my writing projects and blogs and anything else I find interesting. I really, REALLY hope you will enjoy the slightly more diverse content I’m planning…I truly appreciate the fact that I have such wonderful readers. I always love to hear from you! I hope you all have a fantastic weekend! I’m off to buy some boots…. 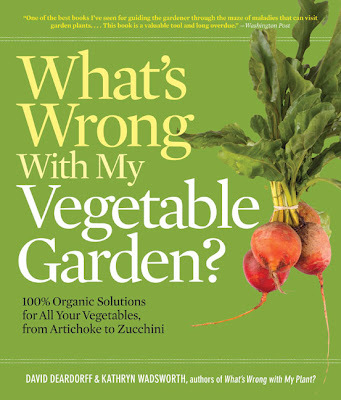 Book review: What’s Wrong With My Vegetable Garden? Want to know why your tomatoes have weird pink spores on them? Or what is causing the veins on the underside of the leaves of your potatoes to suddenly turn purple? This book can tell you those things – as well as how to troubleshoot them using organic controls. Categorized by soil-, light-, temperature- and water-related problems, What’s Wrong With My Vegetable Garden? is a catalogue of pestilence and disease, with precise lists of symptoms to aid in quick diagnosis. Excellent, full-colour photos accompany assist in the I.D. (if you’re squeamish about bugs or bacteria, don’t look at this book while you’re eating!). Every veggie family has its own problem solving guide, which includes organic solutions to get your garden back up and producing again. Detailed sowing and cultural practices are also given for each plant family, using the principles of Integrated Pest (Plant) Management. The focus is on providing the optimal “leg up” for your vegetable garden so that the chance of infection from garden pests is reduced…but should problems arise despite your efforts, you’ll be armed with the proper information to take action. What’s Wrong With My Vegetable Garden? really should be in every veggie grower’s library – while it’s not likely a book you will read cover to cover, the storehouse of information it holds might just save your crops one day! What resources do you use to troubleshoot your garden when you see signs of pests or diseases? Do you use computer search engines or reach for a book, or do you solicit the advice of someone in person? I’m taking part in November’s Garden Book Reviews! 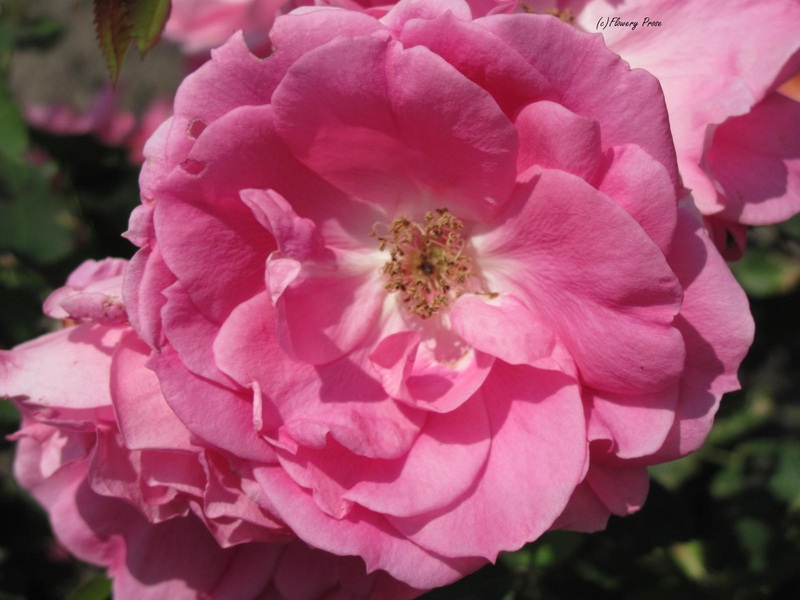 Click on over to Roses and Other Gardening Joys to check out the wonderful reviews by all the participating bloggers! In a rather roundabout way, I recently received a bulletin from the Government of Alberta regarding Late Blight disease, and as this is something that can potentially affect gardeners all across the province this season, I thought I would post the gist of the message in the hopes that we can stem the spread of this extremely nasty problem. Last autumn, a handful of lines in a local rag proclaimed “Rotten tomato season in Alberta.” And you’ve probably noticed that Alberta-grown tomatoes and potatoes have been kind of scarce for awhile now. The culprit is Late Blight disease, caused by a fungus called Phytophthora infestans (it even SOUNDS ghastly). It’s actually the same thing that caused the Irish potato famine in the mid 1800’s…well, combined with the poor idea to plant only one potato variety, which was subsequently completely wiped out. (Monocultures are bad, folks!). We haven’t had a major outbreak of Late Blight disease in Alberta since 1993, and while the fungus usually sticks to attacking potatoes, for some reason in 2010, tomatoes were severely affected as well. (Tomatoes and potatoes are part of the same family: Solanaceae or nightshade, so it naturally follows. Veggies and flowers such as eggplant, peppers, and petunias might also be harmed). Late Blight can occur whenever conditions are just humid and cold enough, and the weather of last summer definitely co-operated in that regard. Unfortunately, the problem wasn’t detected early enough, either, and spread rapidly and rampantly. Phytophthora infestans cannot survive freezing temperatures, so any spores left in the soil will not have overwintered, BUT infected potatoes in storage may still be carrying the bacteria. If these potatoes are used for seed (or are stored near new seed potatoes), there will be a problem. Watch for lesions on potato tubers (and on tomato fruit over this summer. If you still have fresh tomatoes left over from last year, I have some other questions for you). Plants growing in the garden this summer may exhibit lesions around the tips of mature leaves that promptly turn yellow and then brown and crispy – these lesions are patchy and aren’t contained within the veins of the leaves like another disease called Early Blight. Leaves might also show evidence of sporulation: fuzzy white goop on the undersides, spores that easily transfer by wind or rain down into the soil and subsequently infect plant tubers. The key is not to panic, and not to avoid planting nightshade crops altogether, but to watch for the signs and symptoms of Late Blight disease and take action if you notice it. The Government advises burying or freezing affected plant parts (I’m a little bewildered by the “burying” tip – I guess you have to make sure you bury the infected bits well away from healthy plants in the garden so that the spores don’t spread around). If you feel you have to compost the pieces, you’re going to have to forgo use of the entire compost pile for awhile and cover it completely with a tarp so that it doesn’t give the spores a chance to spread. Once the pile has frozen over the winter, it is safe to use it again. Oh, and hope for a hot, dry summer. That’s our best ally against Late Blight. Check agriculture.alberta.ca – FAQs for more information. Remember that this disease isn’t only affecting commercial farmers and market gardeners – many cases last year were found in urban residential gardens. Community gardens may also be at risk. Be vigilant!